I find most fall into one of two categories: 1) you have a morning routine or are working on one; 2) you don't even consider one because 'you don't have the time' or it's not for you. News flash: if you have stress, anxiety, a job, children, or you sleep you could benefit from a morning routine. A few months ago I wrote a post about how and why I started to treat my mornings differently and how you could do the same - read that first. I offered some tips for reflection and carving out time for you. Reflecting on that post helped me realize how much can change in a short time and how much I continue to take better care of myself just by making small changes. In the post I mention wanting to start meditation but having trouble doing it and sticking with it. Now, a few months later, I rely on a few minutes of guided meditation each morning. Let's say you've decided to set your alarm for a bit earlier and carve out some morning time, but you don't know what to do or can't seem to hold yourself to it long enough for it to become a habit. 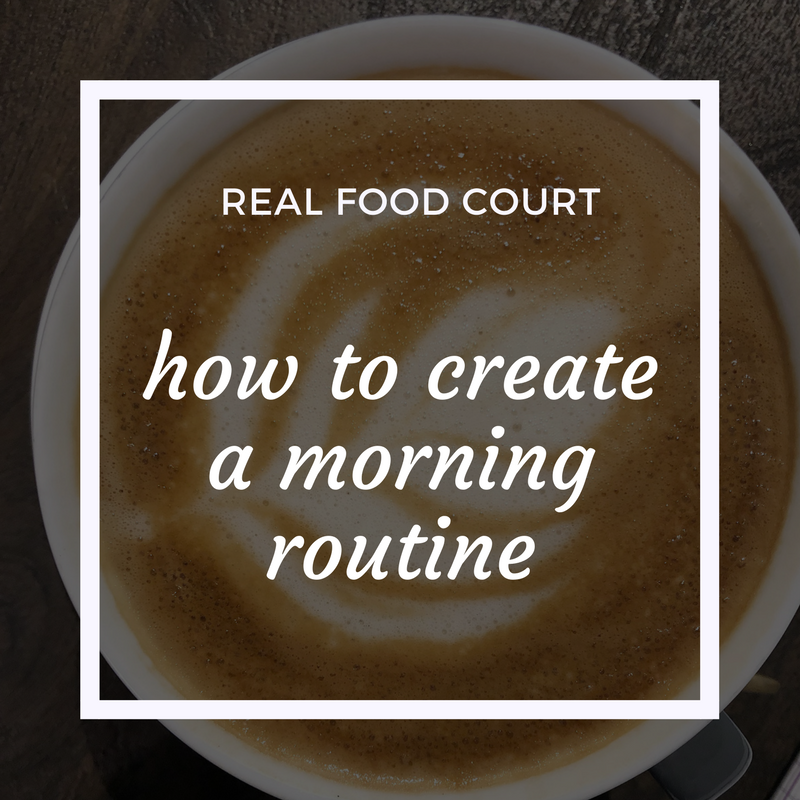 Here are 3 steps to creating a consistent morning routine. This one is huge - you have to want to do it. Don’t try and start a morning routine because you feel like you 'should'. Just the words 'I should do x, y, z' sets you up for feelings of guilt and inadequacy. Shoulding gets you nowhere - you need to want it. I want to start my day less stressed and frantic so my entire day is less stressed and frantic. I want to make sure I get a few minutes of alone time today. I want my digestion to cooperate with me today (just being honest). I want to enjoy the morning because it is my favorite part of the day. I want to start a new habit but haven’t found the time in my day yet. The second your morning routine isn’t optional, it becomes a chore and a source of stress. This can be compared to a relationship with a food you don't trust yourself around. If you tell yourself you can’t eat something, you are much more likely to crave it, want it , and eventually eat it, and overdo it. But, when you tell yourself the food isn't special and you can have it whenever you want, it is less appealing and you can make a decision based on what you really want. All or nothing never works. If you tell yourself you MUST get up, you will soon make excuses for why you can't. Making the activity optional will allow you to consider if you want to do it. Based on the reasons you came up with above, chances are you will be able to think of something! Enjoyment and excitement about that time will keep you going, because you will choose to do it, even though you know you don't have to. We are always evolving and growing! I have made changes since my last post. I found I am more relaxed when I don't get right in the shower. I started treating my weekdays like I treat my weekend mornings. I don't brush my teeth, put in my contacts, or shower until after my morning routine activities. Allowing this slower ease into the day has made it easier for me to include meditation in my day (which was a goal I had back in September!) What started as a 30-day challenge with Sharon Salzberg (author of Real Happiness) has progressed to daily mediation practice. I highly recommend the apps Headspace (trial period then paid subscription) and Insight Timer (free) if you are interested in trying meditation. 5:15 Get up. 5:30 Coffee with Vital Proteins collagen peptides. 10-15 minute guided meditation using an app. Emails or catch up on social media. 6:15 Dry brush and shower. Then I get ready for my day. It has been a journey that I enjoy so much. I love exploring what works and makes me feel good. Pick activities that feel good and bring you closer to your wants and whys! Want it. Make it optional. Enjoy it. What are you waiting for? Make YOU a priority and watch your life change.